Wonderful cruise. The sea days were no problem thanks to Stugeron! Even the force 9 gale on the way back across the Atlantic wasn’t a problem. The itinerary was very good and we even got to see dolphins and whales! Ship was amazing very tastfully refubed recently . Crew where all amazing too they could not do enough for you . The average age was 78 on this cruise. In case of an emergency, a large percentage of passengers would not be able to access the lifeboats as they were unable to use the stairs. The lifts were in constant use, The staff on the ship were lovely. Hard working and friendly. The food was excellent. But since my last cruise, it felt like a hard sell wherever you went. From the spa to the coffee shop. Disappointingly, it was not possible to get a decent cappuccino for breakfast anywhere. The library/cafe sells cappuccino but the staff were unable to make decent ones. They cost £2.50. In this day and age, it would have been easy to install a cappuccino machine for passenger use. This was the most disappointing part of the cruise. Ask for a cabin upgrade if the ship isn't sailing at full capacity. Get a cabin with a window. Take a shoe holder bag for all your nick naks. Take a night light and an alarm clock as the lack of a windows, combined with several change of time zones was disorientating. 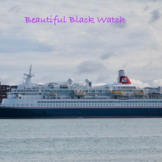 If you choose to follow Black Watch you will receive weekly email updates with the latest reviews, tips, and photos from Cruiseline.com members about Black Watch.